Three shillings and sixpence! 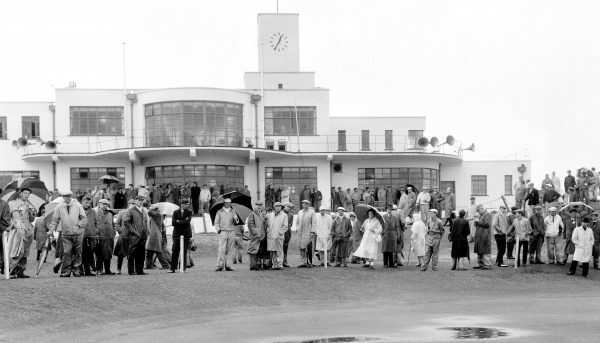 That was the price on the gate to watch the final two rounds of The Open at Royal Birkdale on Saturday, July 15, 1961 [Call it a US dollar, Ed]. Hardly a king’s ransom but my school friend Dave Broadbridge and I were 18, fresh out of school and clean out of cash after our week at the championship. As we saw it there were two options: break into the golf course or return home to Manchester and watch the meager coverage of the last rounds on black and white TV. We opted for the first solution on the grounds that the worst possible scenario was a momentary humiliation of getting thrown out. On approaching the militarily dressed security man I opted for using the name of a member of my home golf club, Major Carr (in fact he wasn’t even a real major but this was how he was known). Rather than being rapidly dismissed we were given a military salute. It could not have been easier. I feel a little guilty about this yet also incredibly grateful. No sooner had Dave and I trodden on the firm turf of Birkdale than we were confronted by a stern and slightly flustered lady official. “Do you boys know anything about golf?” she demanded. We feared our game was up already but answered innocently that we did know about golf. Two scorers for the pair going out in the third round at 10.56 had let her down, and she asked if we could mark the scores for the players. We were not particularly excited about this prospect—we had gate crashed The Open to see if the American hero Arnold Palmer could win—but feeling conspicuous without spectator badges and slightly intimidated, we agreed. To our amazement, the 10.56 game was Arnold Palmer. Before we knew it we were festooned with armbands and accreditation and were standing on the first tee with the great man. There was Palmer, Australia’s Kel Nagle—the defending champ who had defeated Palmer by a shot the previous year at St Andrews—their two caddies, and us; two schoolboys who had lied our way into The Open. His intentions were clear and Palmer was a model of poise and silent concentration on the first tee that morning, and that is how it largely remained for the rest of the day. There was no conversation between Palmer and Nagle at all, and exchanges between Palmer and his caddie “Tip” Anderson were limited to brief words on club selection. At the end of the third round we handed in our cards and the lady official was most appreciative. We were given vouchers for a restorative hot soup and sandwich lunch, which was just what we needed after our morning on the blustery links. Dave and I were asked if we would be available to carry pennants for the afternoon’s final round. The duty involved carrying a flag behind a particular golfer as he progressed around the course, so marshals and the police could easily locate them all. This was towards the end of the era of The Open being staged without fairway ropes to keep spectators at bay (the surging, uncontrollable hordes surrounding Palmer at The Open in 1962 at Royal Troon would force the R&A to put an end to such freedom of movement for spectators). We gladly agreed to flag carrying. Dave and I were on a roll, we were fully-accredited cogs in The Open machine and this afternoon duty would grant us a close-up view of the final round of The Open. To my great fortune and delight I was designated as Palmer’s flag-bearer and I would spend the afternoon surrounded by galleries of an ever-increasing scale, as it gradually became apparent that the winner would be Palmer or Welshman Dai Rees, who was playing in the pair after Palmer’s. During that final round I witnessed at very close range one of the most remarkable shots ever played at The Open. Palmer was leading by one shot from the dogged Rees but the American’s drive on the par-four 15th had faded into gnarly gorse and blackberry bushes. The spectators found the ball, which was only partially visible. Having hitched up his trousers in his inimitable fashion, Palmer took a six-iron and the shot he delivered drew gasps from the crowd. His club scythed through Lancashire sand and roots and the rest is history. His ball found the green, Palmer saved his par and went on to win The Open for the first time by a single shot from Rees. It was a momentous achievement for Palmer and it was for Dave and I too. We had no right to be there at all, yet the day ended with us both attending the prize giving and speeches, still proudly wearing our armbands, of course. We enthusiastically applauded Palmer as he lifted the Claret Jug. He was a truly great champion and it was such a thrill to witness so closely one of his greatest and most famous triumphs.